iGlasses 3.4.6 – Webcam effects and enhancement utility. iGlasses virtual camera lets you do more with your camera. Feeling a bit gray today? Green with envy? 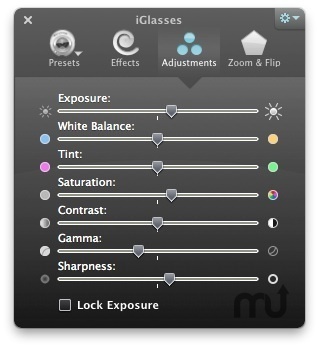 iGlasses puts settings such as color, contrast and brightness adjustments at your fingertips. Even save preset configurations for different lighting environments. You can even override and fine-tune your built-in camera’s automatic exposure and color correction. Why should Photo Booth have all the fun? iGlasses brings fun effects and 3-D distortions to any video app on your Mac, including Skype, Google+ Hang Out and Facebook chat, even ustream and other Web sites. Media Sharing is just one of the great new features you’ll find in iGlasses 3. Drag any image or video file into iGlasses to display it instead of your camera video. Use it to quickly show someone an image, or even to be someone else for a while. The possibilities are endless! Apple’s built-in camera provides a great wide angle, but a nice head-and-shoulders shot gives a more professional look. iGlasses digital zoom is a quick way to enhance the appearance of your video chats. Simple controls allow for full digital pan, tilt and zoom. Can be controlled with an Apple Remote on supported Macs. When you find the perfect combination of adjustments and effects, save your settings for instant access later on. Other video enhancement add-ons only show up in certain apps. iGlasses is everywhere you need it. Simply choose iGlasses as your camera in apps such as iChat, FaceTime, Skype and Web apps such as Google+ Hangout and Facebook video. Some things are best seen first hand. Not sure if iGlasses does what you need? Download the free demo version and try it out for 7 days. Purchase only if you like what you see. Have questions? Send us a message, and we’ll write back as fast as we can. Fixes an installer crash on OS X 10.11 beta. Fixes an issue where iGlasses was not working in Screenflow and Camtasia screen recording apps. Fixes an issue with selecting iGlasses in FaceTime. iGlasses will no longer cause OS X to switch to discrete graphics card mode on some Macs. Next story Amadeus Pro 2.2.2 – Multitrack sound recorder/editor with MP3 support. Previous story MacBooster 3.0.6 – Maintains and optimizes your system (release candidate). iGlasses 3.3.1 – Webcam effects and enhancement utility. Webcam World View 5.1.2 – Travel with Live Streaming. iGlasses 3.4.5 – Webcam effects and enhancement utility.